What might you receive after tax? How does this option compare to drawdown? How to make the most of your tax-free cash? This guide is not personal advice. If you are at all uncertain about the suitability of a product for your circumstances please seek advice. Tax rules change and their benefits depend on your individual circumstances. What you do with your pension is an important decision, which could be irreversible. Make sure you understand your options and check they are suitable for your circumstances: take appropriate advice or guidance if you are unsure. The Government's free Pension Wise service can help. It provides impartial guidance face-to-face, online or by phone - more on Pension Wise. 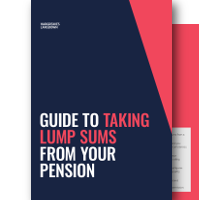 On 6 April 2015, pension rules made it possible to take lump sums directly from a pension from age 55 (rising to 57 in 2028), without having to go into drawdown or buy an annuity. This is known as taking an Uncrystallised Funds Pension Lump Sum (UFPLS). This guide is not personal advice. If you are at all uncertain about the suitability of a product for your circumstances please seek advice. Tax rules change and their benefits depend on your individual circumstances. What you do with your pension is an important decision, which could be irreversible. Make sure you understand your options and check they are suitable for your circumstances: take appropriate advice or guidance if you are unsure. The Government's free Pension Wise service can help. It provides impartial guidance face-to-face, online or by phone - more on Pension Wise.